A trio of two-character plays now running in the Hilltowns and Berkshires offer a summer-season variety of subjects, styles, and even venues – a black-box theater, a converted town hall, a church sanctuary. Pauline Productions is dedicated to “producing and creating theatre with a focus on strong roles for women onstage and behind the scenes.” The Roommate, running till Saturday on a purpose-built stage in the Ashfield Congregational Church, fulfills that mission wholly – a two-woman play written by a woman, with an all-woman creative team, from director Toby Vera Bercovici to Amy Putnam’s convincing kitchen set, Kelsey Book’s lights, and Kaylee Pomelow’s stage management. 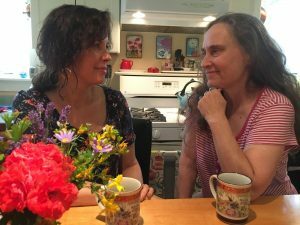 Jen Silverman’s play features a pair of Valley favorites – Lisa Abend and company founder Jeannine Haas. It’s been misleadingly called “a female Odd Couple” (including by me) but it’s deeper, savvier, and at times funnier than the Neil Simon classic. When Sharon, a tidy, sheltered matron, lets out a room in her Iowa City home, the lodger who arrives is Robyn, a gay, vegan, pot-smoking New Yorker with a shady past. Robyn is just looking for a quiet hideaway, but with her arrival Sharon realizes, to her own surprise, that she’s ready for some adventure. Their journey begins predictably enough, with an awkward clash of culture and habit, but soon careens into hairpin plot twists that spin each other’s expectations and comfort zones. What begins as Felix and Oscar quickly becomes Butch and Sundance. When I saw The Roommate on opening weekend, the pace was a little shaky at first, but got up to speed in time for a sweet, funny stoned sequence. The two stars work together beautifully, playing off each other’s contrasting characters – Abend’s Sharon poised and proper, Haas’s Robyn rough and rumpled – as their hilarious and touching relationship takes them both to unexpected places. 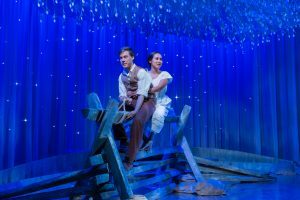 At the beginning of Mary’s Wedding, the brief, poignant little play at Chester Theatre Company through this weekend, we’re asked to remember that “tonight is just a dream.” The fascinating thing about the piece, by Canadian playwright Stephen Massicotte, is its trancelike structure. Time folds and fractures, looping around itself in gauzy vignettes, a story fitfully recalled. The dream is Mary’s, reliving her romance with Charlie, a farm boy who went off to serve in World War I, two years ago now. 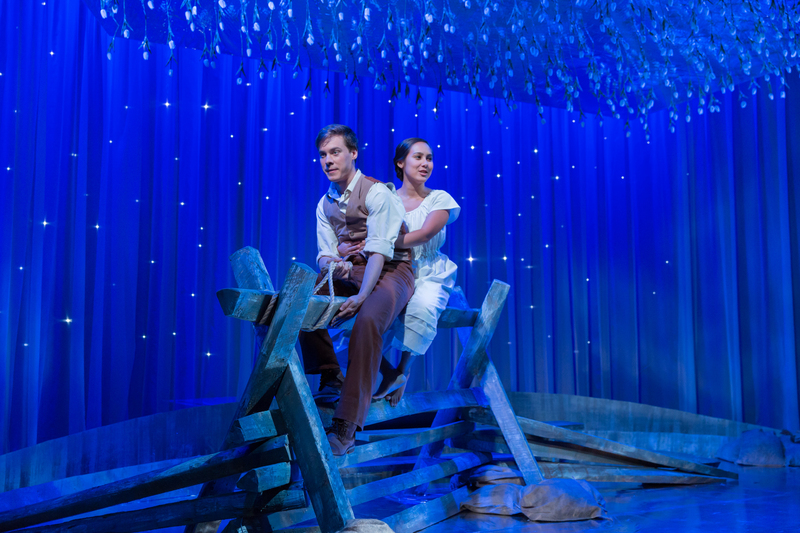 Their love story, set in a barn in rural Canada and a battlefield in far-away France, is told with the dream’s indifference to chronology and reason. Charlie is a simple soul, with eager enthusiasms and a naïve idealism (he believes the romance of Tennyson’s poem “The Charge of the Light Brigade”). Steven Lee Johnson’s performance, though, is anything but simplistic. His portrait of Charlie is at once detailed and expansive, wide-eyed with wonder at the world and this wondrous girl who happens into his commonplace life. This two-hander is a three-character piece – in the battlefield scenes, the actress playing Mary takes the role of Charlie’s sympathetic sergeant. Known as Flowers, he’s an English immigrant to Canada, like Mary, but from a lower class than she, like Charlie. Marielle Young gives Mary a semi-posh accent, a demure pose, and a winning smile, then makes no effort to distinguish her from Flowers physically or vocally. Perhaps this is a deliberate choice – it’s Mary’s dream, after all – but it’s dramatically weak, draining the energy and blunting the class distinction. Colette Robert’s ingenious production serves the dreamscape without getting surreal. Sound, lights, and set – by David Wiggall, Lara Dubin, and Travis George, respectively – all participate in the storytelling and all play multiple roles. A section of split-rail fence serves for both the farm and the battlefield, as well as Charlie’s horse, a rope bridle on a cross beam. Rain on the barn roof turns the frontline trenches to mud. Thunder and lightning scares Charlie, who fearfully counts the seconds “from the flash to the rumble” as storms pass over the farm, and again as artillery shells light the sky over the killing fields. A huge transpacific shipping cube nearly fills the stage in Barrington Stage Company’s intimate alternative theater space. Then one side opens out to reveal a small room adorned with a Victorian Westerner’s flowery notion of “Oriental” decorative art. 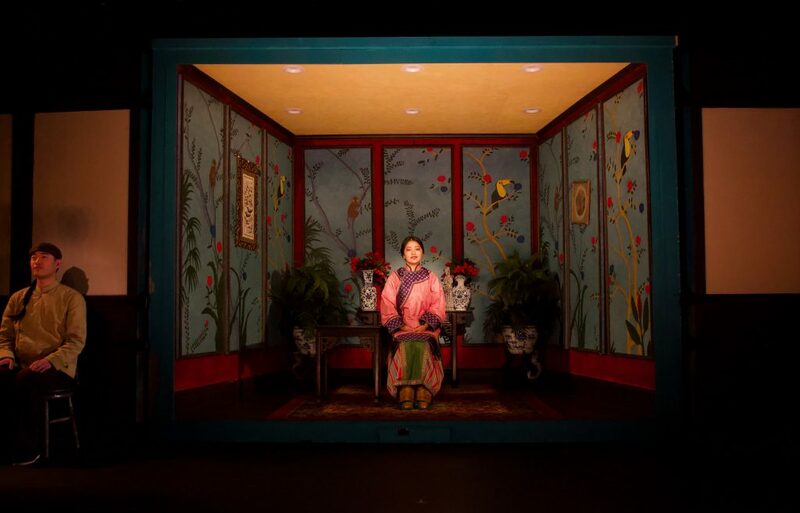 In it is seated a young Chinese woman in traditional costume (by Junghyun Georgia Lee, who also designed the set). She is Afong Moy, a real person, remembered as America’s first Chinese woman immigrant. She was sold by her parents and brought to the U.S. in 1834 by a pair of entrepreneurs who exhibited her to the public as part of a marketing scheme for imported Chinese goods – and oh yes, for “understanding and goodwill between China and America.” She was a sensation, as rare and alien as a visiting Martian. The Chinese Lady, by Lloyd Suh, is a fantasized portrait based on the scanty documentation of her life. Directed by Ralph Peña, artistic director of Ma-Yi Theater Company, it’s receiving its world premiere at Barrington Stage through August 11, on its way to an Off-Broadway opening in the fall. In the little cubicle where she performs twice daily, Afong greets us, the gawking ticket-holders, with a decorous smile. She demonstrates her country’s peculiar customs – eating with chopsticks! – and walks to and fro on her tiny four-inch feet while describing the ghastly process of foot-binding without disturbing her smile. 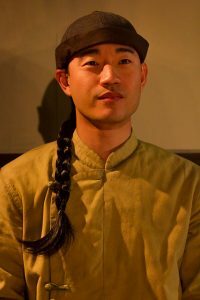 Afong is embodied to perfection by Shannon Tyo, her prim condescension at first denoting exotic foreignness, then increasingly hiding frustration and disillusionment. Just outside the frame of her little stage sits Atung, her translator, stagehand, and minder, himself an immigrant but fluent in this country’s ways. He’s subservient and impassive – the stereotypical “inscrutable Oriental” – but now and then he lets slip a fleeting sneer or cynical glance. Daniel K. Isaac’s Atung is marvelously restrained, only once doffing the mask for a direct-address monologue in which he bares his true feelings and desires, many of them surprising. The playwright follows his heroine into extreme old age (nothing is actually known of Afong’s later life), recounting the indignities and atrocities visited on Chinese immigrants who followed her arrival in the days of the Gold Rush and Transcontinental Railroad. 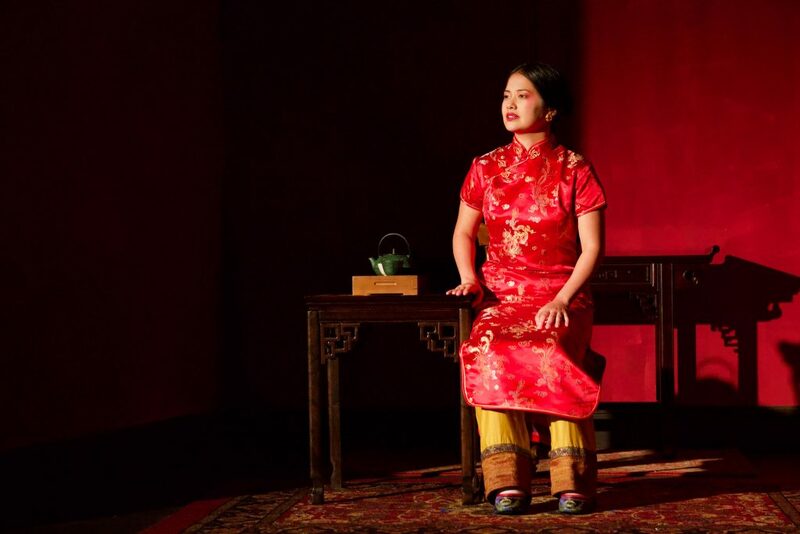 Suh’s historical bio-drama thus becomes a lens that focuses us, intentionally or not, on today’s hideous treatment of immigrants and refugees. It’s our country’s fundamental story, one that bears telling and retelling, and The Chinese Lady does it with imagination and finesse.